Foil bags or as requested. White Or Creamy-white Crystalline Powder. 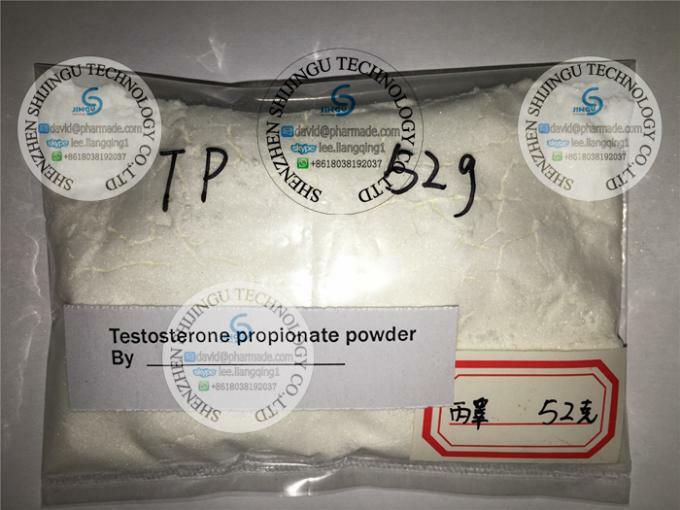 Test Prop, Testosterone Propionate is the shortest commonly ester attached to the testosterone hormone, so it takes your body the least amount of time to rid itself of the ester and release the parent hormone into the body. Many other will stack well with testosterone propionate. 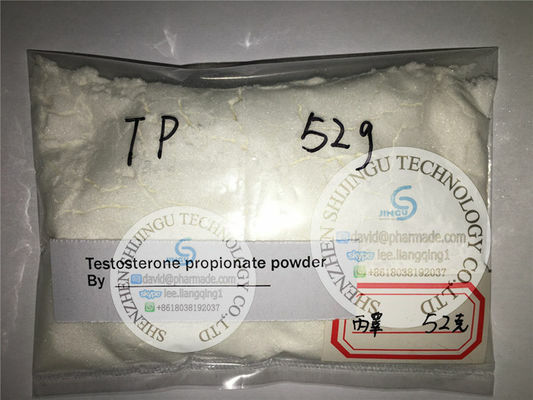 Besides testosterone propionate, trenbolone (trenbolone acetate), masteron (drostanolone), and winstrol (stanozolol) are also favorites for many on a cutting cycle. Alias:Test Prop, Test P, Agovirin, Testosteron, Testoviron. Appreance: White or creamy-white crystalline powder. 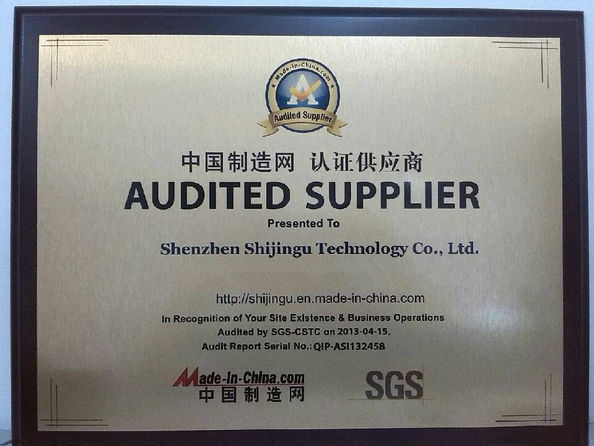 Description: 100 mg/ml, 100 ml, 200 ml 500 ml or 1000 ml discrete packages. Stacking Info: Same as testosterone cypionate. Testosterone Propionate Is An Oil-based Testosterone Compound. Test prop is a commonly manufactured, oil-based injectable testosterone compound @100 mg/ml. The added propionate ester will slow the rate in which the steroid is released from the injection site, but only for a few days. Testosterone propionate is therefore comparatively much faster acting than other testosterone esters such as cypionate or enanthate, and requires a much more frequent dosing schedule. An injection schedule of every third day is about the longest you would want to perform using propionate to achieve good results.For best results - daily injections are more suitable given the nature of this agent. Peak propionate levels take place after 24-36 hours and taper down from there. As a result of the frequency of injections required of propionate, it is not a very attractive steroid for those who are doing their first cycle or those who do not like intra-muscular injections to begin with. For a first cycle, a longer acting, single ester testosterone such as enanthate or cypionate or preferred because in both cases few injections can be made while maintaining stable blood levels and thereby optimizing results. Respectively, enanthate should be injected twice weekly and cypionate once weekly. Since both yield similar results, the first time user would more likely enjoy either of those two compounds over propionate. The benefits of propionate may not be worth the additional energy required for the injections. Propionate is also a relatively painful steroid to inject with uses complaining that the same spots become aggravated with additional injections which require injecting in several different places for prevention of this pain. The injection site may become irritated and users have complained of long lasting pain caused by the injections. For these reasons, propionate is not such a good idea for the first time steroid user, however, enanthate and cypionate are not without their share of complications and all factors should be assessed before beginning with any steroid cycle. If propionate is the steroid of choice, ancillary drugs such as nolvadex, proviron and arimidex are advised to have on hand during the cycle in case symptoms of gyno arise (or if you wish, you can run these drugs during the cycle for prevention). All testosterones will aromatize, although some have a lesser chance of it. Propionate may be one of those drugs, but proper precautions should be taken, nevertheless.